Panelists at Stanford Medicine X judge Diane Jooris’ virtual reality module that is designed to reduce anxiety in cancer patients. The launches of several innovation competitions highlight the need for drugmakers and other healthcare organizations to harness external creativity to find new solutions for their business problems at startup speed. Astellas Pharma, Accenture, and the FDA are three examples of healthcare organizations that have recently launched innovation competitions. Innovation challenges are events or competitions that bring together disparate groups of people to generate ideas around a certain topic or to solve a difficult business issue. These ideas are then judged by experts. Regulatory restrictions, public scrutiny, and a risk-adverse culture are the oft-cited reasons why healthcare companies — and the FDA — are characterized as slow to adapt to change. But hackathons and other types of challenges have become prevalent in recent years. At a MM&M SkillSets Live conference in 2015, Merck executive director Aman Bhandari said there have been more than 200 hackathons in healthcare since 2010. The FDA last Wednesday announced one such contest, the 2016 Naloxone App Competition, to create a mobile app to connect overdosing opioid users with a nearby carrier of an antidote, known as naloxone. The winner will receive $40,000. Peter Lurie, the FDA’s associate commissioner for public health strategy and analysis, said that bringing outside talent in to try and help solve this public health crisis is pivotal to the agency’s mission of preserving the public health. This marks the agency’s second innovation challenge; the first one resulted in the development of an app that allowed the agency to quickly identify salmonella bacteria on fresh produce. For drugmakers, the business case for these competitions is clear. The industry’s interest in creating beyond-the-pill services — such as Boehringer Ingelheim’s gamified support program for COPD and Biogen’s partnership with Fitbit — are one way for manufacturers to differentiate their products to payers, providers, and patients. But pharmaceutical companies’ expertise lies in drug development and traditional marketing methods like DTC advertising — and not in creating innovative mobile apps. 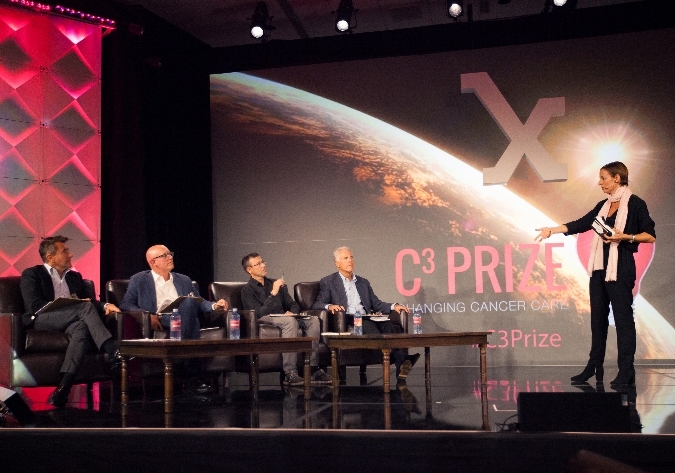 Astellas Pharma, a Japanese drugmaker, brought together five finalists for its Changing Cancer Care (C3) innovation challenge in mid-September. Three winners will receive grants to help fund their projects; one will receive a $50,000 grant and the other two will receive $25,000. The challenge launched on April 25 and is meant to help develop non-medicine innovations in cancer care. Astellas’ submission criteria for C3 focuses on developing services that go beyond treatment — to help patients navigate the healthcare system, adhere to complex medical requirements, coordinate care, and life after treatment. The winner is expected to be announced in early October at the ESMO Congress in Copenhagen, Denmark. Pfizer used an internal innovation challenge to help create a new mobile tool for patientsseeking to stop smoking. The company created a shark-tank style competition for its brand teams, which generated roughly 100 ideas. The winning idea was an unbranded mobile smoking-cessation app developed with the American Lung Association. Pfizer manufactures the prescription smoking cessation aid Chantix. See also: Hello, 2005? Would You Like your Innovation Team Back? A McKinsey & Company report from 2015 posited that digital innovation challenges are attractive to large companies because they produce ideas that companies can act on quickly. Life-sciences consultancies are also seeing the value in connecting startups with drugmakers through innovation events and challenges. Accenture, which estimates that start-up funding for wearables and virtual health will reach $6.5 billion by next year, launched its HealthTech Innovation Challenge on September 15 as a way to bring start-ups together to develop creative solutions for how people can better access and manage their own healthcare. The events, scheduled to take place in London on November 25 and New York on December 1, will include two pitching sessions with senior executives from Novartis, UCB, and other life-science companies. “Creating an innovation challenge helps startups infuse fresh ideas across the system to improve patient care. Innovation challenges are important because it advances innovative collaborations between startups and a broad spectrum of stakeholders,” Anne O’Riordan, senior managing director of Accenture Life Sciences, said in a statement.